You can see carpets in almost any house. People use them as a floor covering for many years because of their look, durability, warmness, and damage resistance. In addition, it is affordable flooring option with a great insulating and resilient properties. 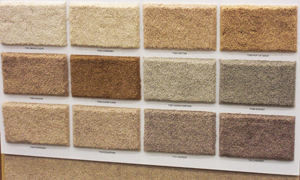 Carpets are available in varieties of colors and patterns that can match with any design you choose. According to your décor, you can install a carpet as a wall-to-wall flooring option, tile carpet (very common in commercial buildings), or put some area rugs. Its quality depends on carpet construction which consists of the fiber types, the backing, the latex used to hold the backings together, weight, density, pile height, twist level of the fiber, treatments for stain resistance, shearing, finishing, and the dye method for coloring carpets. Most used fiber types are nylon, polypropylene (olefin), polyester. There are also other types available on the market which are not as much popular as the first three, but still play significant role on the carpet market. Examples of the other fiber types of carpets are acrylic, wool, cotton, recycled material, and blends (usually they made from mix of nylon and olefin). There is no such thing as a perfect fiber type. All of them have their pros and cons. For instance, fibers made form synthetic materials are more resistant to stains plus they are much less expensive. On the other hand, more expensive options of carpets give you warmness, inviting, and natural feel. Weight of the carpet indicates how much fibers it has. Normally the heavier the carpet the more durable and reliable it is. On the other hand, density shows how close the fibers are tufted together which effects how it will appear and perform. As weight it is also has rule of thumb – the denser the carpet is, the better it is. You can try to reach the backing with your fingers in order to exam its density. If it will be hard or impossible to do that, then you chose very good and durable carpet. There are many colors and patterns of this flooring type available. Carpets can be dyed in almost any color not depending on its fiber type. Homeowners opt for light colors normally when they want their space seem larger than it is. Drawbacks of such light colors are that they might show dirt and stains if you install them in such areas as kid’s or living rooms. For dark colored carpets it works in opposite way. Carpet is a great choice if the budget is limited. Prices for materials and the cost to install carpet is a way less expensive if compare with other flooring options especially tile or hardwood. In contrast to wood flooring options, carpets literally can be installed everywhere in the house. However, it is better to select different types for particular areas. For example, bedrooms are not as abused with thousands of footsteps, therefore you can install there a slightly less dense carpet and save a bit of money over dining, living, and kid’s rooms which require more durable and stain resistant options of flooring. For kitchens it is better to go with other flooring option other than carpet. If you still want to go with that one there anyway then you need to choose an option with short tight dense construction (a berber or looped).